For Friday, a shirt dress from Liz Claiborne. 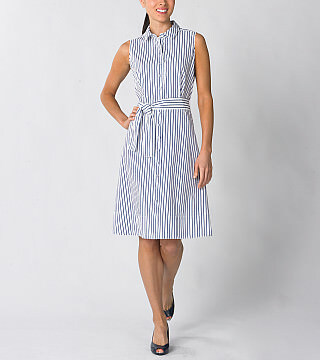 Yes, yes, the brand is slightly stodgy, but Tim Gunn’s in charge now, and for $89 this dress is a nice steal. Fit is key, however: the hem should be tailored to sit just above the knee, and the body of the dress should be fitted. Bare arms aren’t appropriate for the office, of course, so we’d pair this with a structured cardigan (like something from Iisli) or a cropped navy jacket. We also like the way the dress invokes the classic men’s seersucker look without sacrificing an ounce of femininity.